We knew that we needed to rip out our rotting deck this spring before someone got hurt. We also knew that we’d likely need to save for a bit before we could put in a new patio, so we had planned to put grass seed down and call it a day until the fall. Until my mom called last weekend to tell me that she was driving and had seen a house being demolished and that there were piles of bricks everywhere. So she stopped and asked about them and the guy in charge told her we could have as many as we wanted – they were just bulldozing what was left at the end of the week. John went off and hauled bricks all day and, long story short(ha! 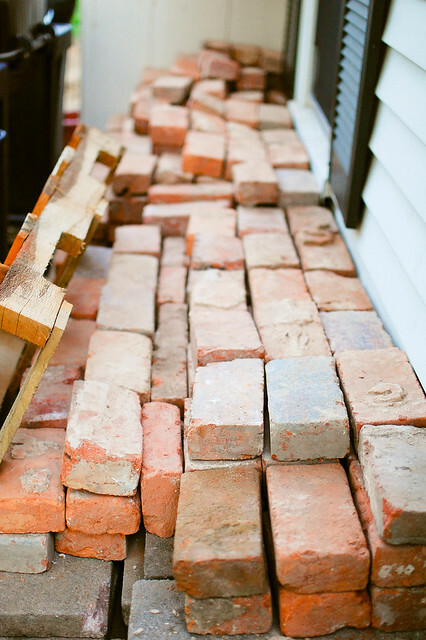 ), we now have enough bricks for a patio and then some – all for free. S0 happy! That is an amazing find! My husband would be in heaven with a pile like that.